The Ellsworth Street bridge, where ODOT hopes to work on the vertical clearance, in a file shot from November 2014. It lacks something in entertainment value, but if you use the roads and bridges around the mid-valley, the draft of the next STIP is of interest anyway. The letters stand for Statewide Transportation Improvement Program. And ODOT has just invited the public to comment on the draft for 2018-21. So I looked it up and plowed through the parts for Benton and Linn County. Having just come off I-5 from the south, I was hoping to find mention of something that would ease the frequent afternoon congestion on the two northbound lanes from Eugene. Alas, no such luck. There is, however, a plan for a major expense. It is to “diamond grind” and patch the concrete driving lanes for 18.5 miles from the north Albany exit to the Halsey ramps. This would be done in 2018 and cost an estimated $15 million, including engineering and such. In Albany, the draft plan calls for a $5.8 million project to do something about the vertical clearance of the Ellsworth Street Bridge in 2020. Presumably they mean to increase the clearance on the span, which was built in 1925. Now and then, the overhead girders take a beating from some oversized rig. The concrete bridge deck, by the way, is developing pot holes, but there’s nothing in the STIP about redoing the pavement. 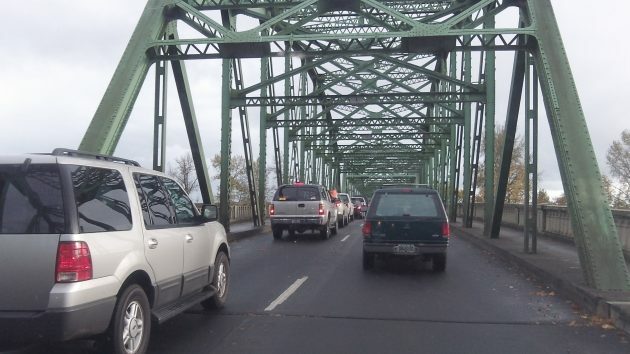 Another Willamette River bridge, the Albany-Junction City Highway span at Harrisburg, is in the plan for a $3.6 million replacement of steel bracing and a paint job, both to be done in 2020. 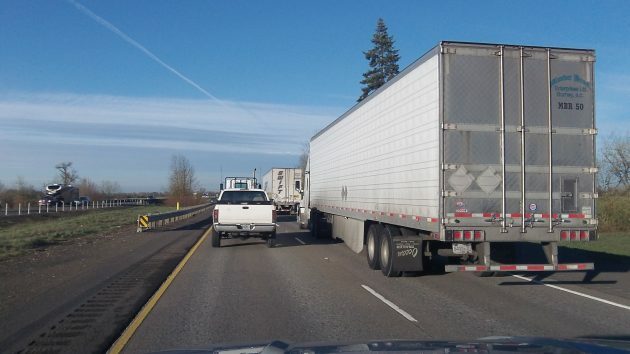 On the Albany-Corvallis Highway (US 20), the program lists widening the shoulders in 2020 for half a mile from Garland Nursery to the junction with Granger and adding a median acceleration lane, a left turn lane and a buffered right turn lane. The cost is shown as about $4 million. At Merloy Avenue, there’s to be a left turn provided in 2019, costing about $1.9 million. Also on Highway 20, the plan shows construction in 2018 of 1.72 miles of a long-awaited off-highway bike and pedestrian path from Scenic Drive to Spring Hill at a cost of $2.7 million. This was to hook up with the Albany-Corvallis bike trail along the railroad tracks at Scenic, but Benton County has dropped that project. The county commissioners plan to discuss on Jan. 3 whether to continue looking for another route. Even if they don’t, the segment from Spring Hill to Scenic, which is within Albany, will get cyclists off a narrow and winding section of the highway. Speaking of “multi-use paths,” the STIP has one scheduled in Sweet Home in 2018. It goes along Highway 20 for one mile and will cost around $1.8 million. These are the most interesting of the many projects listed. You can find the draft plan here. People with comments will be offered a combined 20 minutes to have their say at the start of a Jan.26 meeting of the local Area Commission on Transportation. The comment period starts at 5 p.m. that day in an upstairs conference room of the Cascades West Council of Governments, 1400 Queen Ave. S.E. The STIP lists a project to smooth the concrete on I-5 south of Albany, but nothing to ease frequent congestion like this on Wednesday afternoon. The draft is a real page turner. A planning/budget document. Work details to be developed.